I have a long back-log of ARC books that I’m trying to catch up on and as I write this, Noah’s Rainy Day by Sandra Brannan is the oldest book in my queue. One of the reasons I kept putting it off, I think, is because of the title, which sounds more like an Easy Reader Chapter Book than a captivating mystery. But this is a captivating mystery. It’s a page-turning thriller and author Sandra Brannan really turns up the tension, building the book, layer by layer. Liv Bergen is a recent Quantico-trained FBI agent. When the five-year-old son (Max) of a very wealthy, connected New York mogul goes missing between connecting flights from New York to Los Angeles, Liv is requested to work the case. Her connection to the wealthy man is tenuous (her sister briefly dated him) but it’s enough to make local agent Streeter Pierce suspicious. Agent (and lover) Jack Linwood is also on the case. Given Max’s wealthy father, and the separation of Max’s mother and father, Agents Bergen, Pierce, and Linwood follow up on the most obvious of crimes: kidnapping for money or kidnapping for parental care. But Noah Hogarty learns another possibility. Noah is the nephew of Liv Bergen. Born with severe cerebral palsy, Noah’s an intelligent young boy trapped inside his own skull, working hard to find ways to get attention and to communicate with those around him. He’s managed to find a way to communicate with his parents, though most might not believe that his complicated system of “yes” “no” and spelling out he alphabet is anything more than his mother’s imagination. But now he must get his mother’s attention and then convince others to get in touch with his Aunt Liv, because he believes he knows something important about the missing boy case. Author Brannan really does a great job of building tension, especially when we are inside the mind of Noah. Near the climax of the book I was reading at a fevered pace, willing the information to come faster in order to save young Max. I recognized and appreciated the beautiful prose, leading me in this direction. Liv Bergen is an interesting, strong female agent and I find it interesting to learn after the fact that this is the fourth book in a series (no worries … there doesn’t appear to be anything crucial to know prior to this to enjoy this book). If this is her first FBI case, what happened in the first three books? I definitely want to know, and I am very curious to read more of her adventures following this as well. But as well-built as the suspense and tension is, all is not well with this book. The story comes from multiple points of view. Sometimes Noah, sometimes Agent Bergen, sometimes the kidnapped boy, sometimes the kidnapper. It’s a bit of a mess, stylistically and slowed my reading when I was wanting to really get in to the story and read faster and faster. There is also the fact that the mystery is solved not so much by great detective work, but a lot of happen-stance and coincidence. And the final moments are almost laughably poorly managed by three FBI agents, all to try to draw out the suspense just a little bit longer. This is a case where I feel a stronger editing hand would really have helped an otherwise nicely written suspense. Looking for a good book? 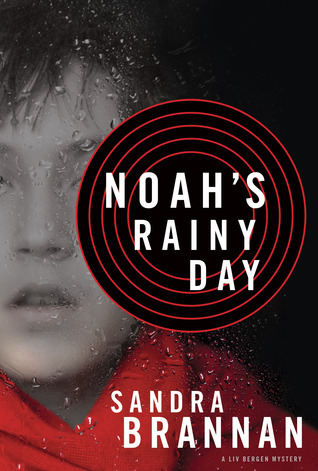 Noah’s Rainy Day by Sandra Brannan shows a lot of promise and delivers some intense suspense, but a few choices along the way derail an otherwise fine read.